Pavement ants are considered to be one of the most common ant species within the United States. These insects received their name due to the fact that they have a tendency to nest and burrow underneath sidewalks, the slabs of buildings, and driveways. These insects create mounds of dirt in and around these areas. The pavement ant is a soil-nesting, introduced ant species. It is believed that the ants originated in Europe and made their way to the United States through merchant vessels during the 1700s and the 1800s. It is common practice, during those years, to weigh down these merchant ships with soil on voyages over the seas. Once the vessel reached its destination port, the soil was removed to make room for the goods that would be transported back to Europe. It is believed, when the soil from Europe was unloaded, pavement ants were also unloaded at the port. Naturally, over time, these ants made their way across the nation. While pavement ants are considered to be the least destructive of all insects, they do pose problems. In this brief guide, you will be introduced to these issues. There are a large number of insects that have the potential to spread diseases; pavement ants are just one type of insect that may spread diseases. This often stems from the fact that these ants commonly feed on the same foods that humans consume, on surfaces that are considered to be soiled, the organic-based materials that are often found in drainage pipes, and other environments that are laden with unsafe pathogens. 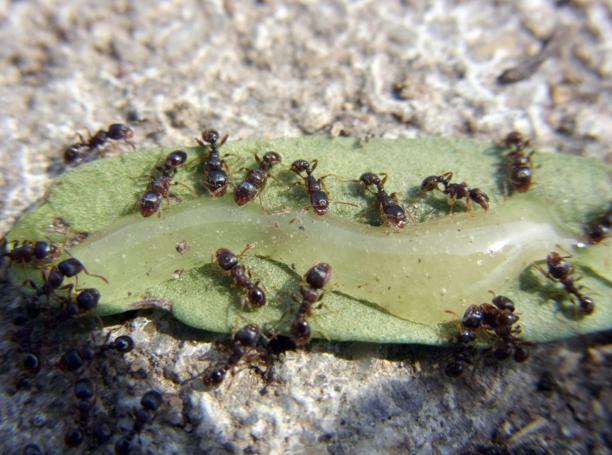 Pavement ants are known to consume just about any type of food product. Examples of these items include seeds, honey, bread, various types of meats, and other types of human and animal foods. According to studies, pavement ants have the ability to contaminate foods. This contamination may occur at an outdoor picnic or a backyard barbeque; however, if these ants invade your home, the contamination may occur in your own kitchen. While pavement ants have the potential to spread diseases by contaminating food products, that is not the only complication that may occur. If pavement ants come in contact with any type of food consumed by humans and their pets, that food should be disposed of immediately because of the health risks associated with the direct contact with the pavement ants. These insects not only contaminate the food, but, may cross contaminate food products. Additionally, the ants may leave behind excrements and/or shed body parts in food products. The food losses that may occur with the presence of a pavement ant infestation may result in several hundreds of dollars of food having to be thrown out. In addition to spreading diseases, food contamination, and food losses, if pavement ants feel threatened, they have the potential to sting. In most instances, these insects are considered to be docile. They are not at all aggressive; however, several people have experienced adverse reactions from the stings caused by pavement ants. This, in turn, could turn into unnecessary medical expenses.